Harrisburg, PA – United Way of Pennsylvania presented its highest annual award, the Keystone Spirit of United Way award, to Erie County resident Thomas B. Hagen at a celebration hosted by Erie Insurance on September 12, 2018. The Keystone Spirit of United Way Award was created by the United Way of Pennsylvania to recognize exceptional and sustained volunteer and philanthropic leadership. The criteria for selection of an honoree reflect a philanthropic impact and personal commitment of time and talents reaching across community borders to highlight the interdependence and opportunities of the United Way network across Pennsylvania. The winner shows exceptional and sustained engagement with United Way in their own community, personal commitment to the voluntary system of human services as demonstrated by gifts of time and financial resources, with United Way being the main focus of his or her efforts, and a quality of performance that inspires others to serve. “Mr. Hagen’s impact in Erie County has been far-reaching, from fighting against poverty and for affordable housing, to mentoring young leaders. But he has always been steadfast in his commitment to investing in the community through United Way. This is what made him stand out in a very impressive field of nominees,” Kristen Rotz, President of United Way of Pennsylvania, said. United Way of Pennsylvania (UWP) presented the award at an event hosted by Erie Insurance Company on September 12, 2018 in Erie, PA. Timothy NeCastro, CEO of Erie Insurance, introduced Thomas Hagen to the assembled crowd and gave an overview of his achievements. Thomas B. Hagen is the current Chairman of the Board of Erie Insurance Group. He began his career at Erie Insurance as a part-time file clerk in 1953 and retired 40 years later as Chairman and CEO. Erie Insurance is the largest employer and the only Fortune 500 Company headquartered in Erie County. He is also Chairman of the Board of Custom Group Industries, the collective name for the three Erie, Pennsylvania based manufacturing companies in which he has had an ownership interest since 1997: Custom Engineering Co., Venango Machine Company and Lamjen, Inc.
Hagen is a Tocqueville Society member from United Way of Erie County and was awarded the prestigious Keystone Spirit of United Way Award for his generosity, advocacy and commitment to improving the lives of Pennsylvania residents. Hagen and his late wife, Susan, have been Tocqueville Society members since 1992. Tom has been a tireless ambassador and advocate for United Way for decades. As Chairman of the Boards of both Erie Insurance Group and Custom Group Industries, he has promoted a spirit of giving to United Way as part of the corporate social responsibility for these companies. Hagen began volunteering in the annual United Way Campaign over 50 years ago and since then has demonstrated an exceptional commitment to the United Way and its work to improve lives. Hagen has volunteered to speak to United Way’s Young Leaders Society members about his belief in United Way’s mission and encouraged others to support United Way’s work. He has helped establish relationships between United Way representatives and numerous community leaders over the years, serving as an invaluable resource to grow United Way’s network of support throughout the region. Hagen has received numerous honors for his tireless volunteerism, including the naming of the Thomas B. Hagen History Center, Pennsylvania Governor’s Patron of the Arts Award, and the United Way of Erie County Tocqueville Award for community services. He was recently honored by Behrend College with its highest award, the Behrend Medallion, and by the Pennsylvania Society naming him a Distinguished Citizen of the Commonwealth. And, most recently, Hagen was named the 2018 recipient of The Erie Community Foundation’s Edward C. Doll Community Service Award. A retired U.S. Navy Captain, Hagen served on active duty during the Cold War as Supply Officer of the Atlantic Fleet destroyer USS Harwood and on Reserve duty with the logistics staff of the Commander-in-Chief, U.S. Atlantic Fleet for a total of 30 years of service. Born in Buffalo, NY, Hagen was raised in Erie, where he attended public schools and graduated from Strong Vincent High School. Hagen attended Penn State Erie, The Behrend College and graduated in 1957 with a BS Degree in Business Administration (Insurance) from The Ohio State University, where he was a Griffith Scholar, President of the Insurance Society and Treasurer of Phi Kappa Psi Fraternity. Edinboro University of Pennsylvania conferred on Hagen the honorary degree of Doctor of Public Service in 1996 “In recognition of [his] leadership in the cause of civic and social responsibility…” and Mercyhurst University conferred on him the honorary degree of Doctor of Laws in 2016. In 2015, Hagen established the Susan Hirt Hagen Fund for Transformational Philanthropy at The Erie Community Foundation with a $10 million gift on behalf of the Hagen family in memory of his wife, Susan Hirt Hagen. In 2016, this Fund granted $1.5 million to support a joint effort of United Way of Erie County and Erie’s Public Schools to increase access to coordinated health, social services and after-school programming by utilizing the nationally-renowned “Community Schools” strategy. Hagen, with his late wife Susan who was a prominent community leader, is the parent of two grown children and three grandchildren. Photo featuring (left to right) Kristen Rotz, President of United Way of Pennsylvania, Thomas B. Hagen, Award Recipient, Tim NeCastro, CEO of Erie Insurance, and Bill Jackson, President of United Way of Erie County. 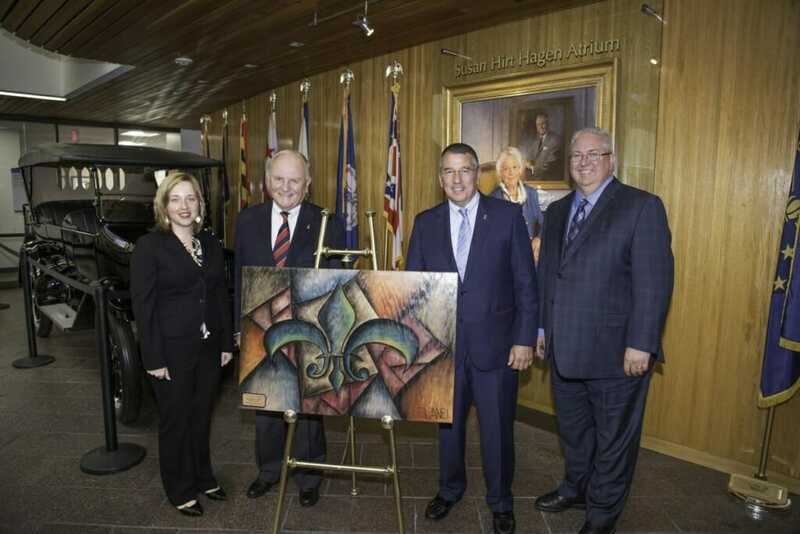 The painting in the foreground is an original of Tom Panei, a Pennsylvania Artist, that was presented to Thomas Hagen. Susan Hirt Hagen, Thomas Hagen’s late wife, is featured in a portrait in the background.